The fresh move against Onnoghen came after the National Industrial Court, Abuja, had on Monday restrained the Chairman of the CCT, Danladi Umar, the AGF, the Code of Conduct Bureau and the police from removing Onnoghe. 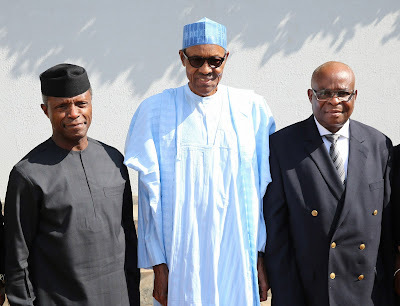 Meanwhile, the opposition political parties on Friday claimed they had uncovered a plan by the Federal Government to arrest Onnoghen on Tuesday. The first national spokesperson of the Coalition of United Political Parties, Imo Ugochinyere, made the claim at a press conference in Abuja on Friday. Ugochinyere said the arrest would be carried out shortly after a bench warrant would have been issued by the CCT against Onnoghen. He added that arrangements had been concluded to immediately name Justice Justice Ibrahim Muhammad as acting CJN. He said Nigeria’s democracy was currently in danger. “Members of the cabal in the Presidency have just concluded a meeting last night (Thursday) where they have now set the stage to burn down the institution of democracy and constitutional governance for the purpose of achieving a narrow aim of annexing the judiciary..."